Coosaw Creek to me is the only neighborhood to live in North Charleston, SC. 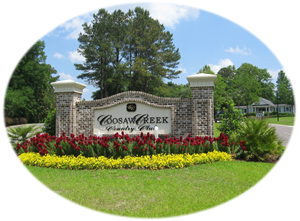 Coosaw Creek is a gated community that began development in the 90s and features a country club clubhouse, tennis facilities, pool, putting green, driving range, and wonderful golf course. Homes in Coosaw Creek go anywhere from $250s to over $1M for the very large, but the average is $515,000. When buying real estate in Coosaw Creek in North Charleston it is required to purchase a country club membership to be a homeowner in the neighborhood. * There is a one time $4000 HOA fee (at closing), a yearly HOA fee of $3000, $125 quarterly “food/dining” requirement, and a $200 month club dues requirement to live in Coosaw Creek (for use of golf course with no greens fees). Most homes in Coosaw Creek are brick and custom built with large lots at least a 1/3+ of an acre, the streets are large enough to walk your dog, drive your golf cart, or bike safely. If you are looking for real estate for sale in Coosaw Creek please feel free to look at the available listings below and contact me for showing. There are still occasional new homes being built and many houses in the neighborhood were built within the last 8 years. If you’d like to see Coosaw Creek real estate listings for sale please feel free to contact me for a showing. Another NICE community in North Charleston worth checking out is The Refuge at Whitehall and Cedar Grove.